This page documents the tornadoes and tornado outbreaks of 2013. Strong and destructive tornadoes form most frequently in the United States, Bangladesh, Brazil and Eastern India, but they can occur almost anywhere under the right conditions. Tornadoes also appear regularly in neighboring southern Canada during the Northern Hemisphere's summer season, and somewhat regularly in Europe, Asia, and Australia. There were at least 903 tornadoes confirmed in the United States in 2013. 115 fatalities have been confirmed worldwide in 2013: 55 in the United States, 31 in Bangladesh, 24 in China, three in Turkey and two in Brazil. One of these tornadoes was the largest ever at 2.6 miles wide. On April 1, Canada began utilizing the Enhanced Fujita scale to rate tornadoes with minor modifications to better suit the region's tornadoes. Entering 2013, the Oceanic Niño Index (ONI) for the three-month period lasting from November 2012 to January 2013 based on sea surface temperature (SST) anomalies was -0.3, denoting cooler than normal SSTs in areas of the Pacific. Throughout early to mid-January in the United States, there was isolated tornado activity, centered primarily in the South. In late-January, an unusually strong upper-level trough combined with atmospheric instability produced a widespread tornado outbreak over the Southern United States. The strongest of these tornadoes was an EF3, the first intense tornado confirmed in the U.S. in 2013. In eastern Australia, the remnants of Tropical Cyclone Oswald produced significant flooding in conjunction with tornadoes in late January. A small outbreak on February 10 spawned an EF4 tornado that affected Hattiesburg, Mississippi. A period of inactivity followed the early weeks of the year. Both March and April had near-record low activity, which was attributed to cold air persisting over much of the continental U.S., preventing any significant severe weather from occurring (and allowing for late-season winter storms). However, this pattern changed abruptly in mid-May as a significant outbreak struck towns in north-central Texas, followed closely by a much larger outbreak that affected much of the Midwestern and Southern U.S., especially in Oklahoma. On May 20, an EF5 tornado struck Moore, Oklahoma. Another powerful outbreak struck the Midwest and Ark-La-Tex area in the final week of May. The outbreak produced the widest tornado in recorded history, just west of Oklahoma City that hit areas just south and southeast of El Reno on May 31, killing storm chaser Tim Samaras and his two partners and injuring The Weather Channel's Mike Bettes' Tornado Hunt team. June and July were both below average for tornadoes, and August and September were generally near average for tornadoes. Early October featured a very small outbreak of tornadoes over Nebraska and Iowa; however, two of the tornadoes were violent enough to be rated EF4. Another small outbreak with mostly weak tornadoes ended the month, pushing October activity to near average. After a lull in activity during the first half of November, a large outbreak occurred on November 17, producing 73 tornadoes and killing seven people. Overall, November was slightly above average for tornadoes. December was below average for tornadoes, with only 13, causing 2013 to end with a record low tornado count with adjustments made for undercounting tornadoes in earlier years. Unlike the United States and Canada, the majority of Europe uses the TORRO scale and the Fujita scale to classify tornadoes. The European Severe Storms Laboratory maintains a database of all severe weather events across the continent. The vast majority of tornadoes go unrated due to a lack of surveys; however, some nations, such as France, provide detailed reports on these events. Of the 57 reported tornadoes during 2013, only 18 have been rated thus far. Totals are derived from this database and considered preliminary. There were 87 tornadoes reported in the U.S. in January, of which 75 were confirmed. Just before 2 pm AEST two tornadoes tore through the towns of Jundah and Stonehenge in western Queensland, over 1,100 km west of the state capital Brisbane. Damage was significant in both townships, Jundah had significant damage to 80% of buildings and Stonehenge was without power for 52 hours after the tornadoes hit. The impact of the tornado on Jundah caused all communications networks to go down, power was lost, and the single channel radio networks, microwave networks and battery backups went out. The damage to homes alone was estimated to be at least A$1 million, and about A$600,000 worth of damage was done to Barcoo Shire Council properties. The tornadoes were each rate at F1 on the Fujita scale, with winds recorded at 140 km/h near Jundah. A tornado impacted the New South Wales town of Ungarie, located over 500 km west of Sydney the town has a population of approximately 350. The damage was significant enough for Disaster Relief Grants to be made available to those affected by the storm. The cost of the damage to public and private infrastructure in and around Ungarie is estimated to be about A$3 million. On the Australia Day weekend, up to nine tornadoes were spawned across the state of Queensland by ex-Tropical Cyclone Oswald. The first tornado struck the coastal town of Bargara, east of the city of Bundaberg, at 1 pm on January 26, injuring 17 people and damaging 150 properties. The second tornado struck the town of Burnett Heads at 3:30 pm, and then a third at Coonarr. Bungadoo, a town 40 kilometres (25 mi) southwest of Bundaberg, was also struck by a tornado after 4 pm, and Burnett Heads was hit again at 6:20 pm Radar imagery showed a possible sixth tornado 30 km west of Maryborough. In the early hours of January 27, a tornado struck Burrum Heads 45 kilometres (28 mi) south of Bundaberg, whilst radar imagery showed "possible tornado activity" on Bribie Island. The ninth tornado was reported at Mooloolaba, which swept through a housing estate, uprooting trees and causing minor damage. As a result of the tornadoes, the entirety of Southeast Queensland, including Brisbane, the Sunshine Coast and the Gold Coast, was placed under a tornado watch for January 27. With five confirmed and another four suspected tornadoes, this was the largest tornado event on record in Australia. In a separate incident, a small tornado was spotted over Canberra on January 26. As an intense upper-level trough moved across the interior United States, an extremely warm air mass spread eastward ahead of the storm, resulting in slight atmospheric instability in the Tennessee and Ohio River valleys. The warm air mass was followed by a strong cold front, causing temperatures to fall below freezing. With increased instability in the region, a quasi-linear convective system (QLCS) formed and moved across the area ahead of the cold front, producing numerous tornadoes and wind-related damage. Over a two-day period from January 29 to January 30, 962 tornado, hail, and strong wind reports were received by the Storm Prediction Center (SPC). Of these, 83 were tornado-related reports. The strongest of these tornadoes occurred on January 30 and affected areas of Bartow and Gordon Counties in Georgia. The high-end EF3 killed one person in Adairsville, ending a record 220‑day streak without a tornado-related fatality in the United States, with the last death occurring due to an EF2 tornado associated with Tropical Storm Debby in Florida in June 2012. The 65 confirmed tornadoes was the third most ever recorded to occur in January. The outbreak was the largest January-tornado outbreak in Middle Tennessee, which confirmed 22 tornadoes. There were 46 tornadoes reported in the U.S. in February, of which 39 were confirmed. EF4 damage to a house that was completely leveled by the Hattiesburg, Mississippi tornado. As a large and powerful area of low pressure moved across the northern Plains, powerful severe thunderstorms developed across a trailing cold front. These storms, located across Louisiana and Mississippi primarily, prompted many tornado warnings. Shortly after 5:00 pm CST (2300 UTC), a large and extremely dangerous tornado was confirmed southwest of Hattiesburg, Mississippi; this wedge tornado, documented by locals and storm chasers, moved through the city after prompting a tornado emergency for the surrounding locations. Severe to locally catastrophic damage was reported in Hattiesburg and the nearby city of Petal, leaving 82 people injured. The tornado was initially rated an EF3, but was later upped to an EF4 on the Enhanced Fujita Scale. Mississippi Governor Phil Bryant issued a State of emergency for Forrest, Lamar, Lawrence, and Marion Counties due to the impact of the severe storms and tornadoes in those counties. In mid-February, a strong extratropical system moved across the United States near the border with Canada. A cold front extended from it towards the Southeastern United States, generating thunderstorm activity. The SPC issued a slight risk zone for areas of Texas, Arkansas, and Louisiana by 1300 UTC on February 18, mentioning the possibility of organized storm activity including bow echoes and supercells. Strong wind shear and cold temperatures aloft contributed to the development of supercells by noontime, which produced large hail and tornadoes. Many, mostly weak and brief, tornadoes touched down across extreme east-central Texas (east of Tyler). All of these tornadoes traveled less than two miles and caused mostly minor tree damage. However, a few structures sustained roof damage and a large barn and a small shed were destroyed. Further east, one tornado touched down in Arkansas, southwest of Garland. It downed a few trees and was rated as an EF0. To the south, in Louisiana, three EF0 tornadoes touched down across Caddo and Desoto Parishes. These tornadoes were brief and only downed a few trees. No deaths or injuries were reported with these tornadoes. Several tornadoes struct the New South Wales coast during the overnight period of February 23–24. Five tornadoes were investigated by the Australian Bureau of Meteorology on the south coast, initial analysis indicated an EF1 struck Kiama leaving a damage path 4 km long, Jamberoo was hit by an EF0 with a trail of damage 8 km long, and Gerroa to Nowra was struck by an EF2 that left a damage path 16 km long and 200–300 metres wide at its greatest. The tornado that swept through the town of Kiama caused extensive damage to around 75 homes in the area. Further north in Sydney a funnel cloud was reported at Kirribilli just after midnight accompanied by winds to 135 km/hr recorded at Sydney Harbour. There was major damage to the roof of the Sydney Flying Squadron, the local Westpac bank, and the surrounding area. Major damage also occurred in Chifley, Malabar and Moore Park where part of the roof of Fox Studios was removed. There were 18 tornadoes reported in the U.S. in March; however, 19 were confirmed. A strong upper level system with a moist south to southeast flow produced severe weather, including several tornadoes that injured 10 people altogether, across the Southern United States, especially Tennessee, Alabama, and Georgia. An EF1 tornado near Boaz, Alabama destroyed two mobile homes and overturned another, injuring three people. An EF2 tornado struck Kilpatrick, Alabama, causing significant damage to several mobile homes and destroying two others. Seven people were injured with this tornado. During the afternoon an evening of 21 March severe thunderstorms spawned seven tornadoes in northeastern Victoria. The towns of Yarrawonga, Bundalong, Mulwala, Rutherglen, Koonoomoo and Cobram were hardest hit. In Mulwala, the Denison County Caravan Park was seriously damaged. Eighty people were injured, with two men airlifted to Melbourne in critical conditions. On March 22, a deadly tornado that took place in the Brahmanbaria District of Bangladesh. The tornado struck 20 villages with along an 8 kilometres (5.0 mi), traveling at a speed of 70 kilometres per hour (43 mph) killing 31 people and injured approximately 500. The worst damage occurred in the Bijoynagar and Akhaura, Brahmanbaria Sadar Upazilas of this district. Thousands of trees and utility poles were toppled and thousands of peoples were left homeless. The tornado disrupted both train and road communication, which interrupted rescue operations. Part of jail house of this district was collapsed, resulting in the death of one guard. Many crops, mostly consisting of rice, were damaged as well. Both Prime minister Sheikh Hasina and opposition leader Khaleda Zia visited the impacted areas to meet the affected people and distribute relief. On March 21, powerful storms with large hail and a tornado hit Daoxian and Fujian provinces in China. 24 people were killed, with 11 of them on a ferry that capsized, and 148 were injured by the storms. A tornado moved across marshland on the island of Mindanao in the southern Philippines on March 27. It passed near an overloaded boat triggering a panic that caused the boat to capsize, killing 12. The boat had a capacity of 10 but was carrying 18. There were 83 tornadoes reported in the U.S. in April, of which at least 80 have been confirmed. As a powerful trough moved into the Rocky Mountains, return flow from the Gulf of Mexico provided ample moisture for the development of severe thunderstorms. This resulted in a moderate multi-day tornado outbreak that produced 28 tornadoes. A brief rope tornado was reported on April 7, near Paradise, Kansas, but no damage was reported. The following day, several tornadoes were reported in Colorado, Kansas, and Nebraska. The first tornado (rated EF0) touched down in Kit Carson County, Colorado, causing no damage. The second tornado (rated EF1) touched down shortly before 0300 UTC in Nebraska, causing substantial damage to a farm and feed yard. Cars and trucks were flipped off of highways, power poles and trees were snapped, and many buildings were damaged. No tornadoes were observed the following day, April 9, due to an inversion aloft, but many reports of large hail were received from Iowa to Texas. As the system pushed eastward across Missouri and Arkansas, and as a warm front drifted northward, severe thunderstorms broke out along both boundaries. Several storms in association with a squall line caused damaging winds. That evening, a damaging EF2 tornado touched down in the St. Louis suburb of Hazelwood, Missouri, tearing the roofs off of several homes and apartment buildings, downing numerous trees and power lines, and flipping many cars. Another EF2 tornado touched down in Van Buren County, Arkansas, prompting a tornado emergency. Significant damage was reported near Scotland, including many vehicles thrown off the road and many homes and other buildings being destroyed. The supercell that spawned the Scotland area tornado also produced a damaging EF2 near Mt. Olive as well. On April 11, a supercell ahead of the squall line developed in eastern Mississippi. A large wedge tornado touched down in Kemper County and moved into Noxubee County and Pickens County, Alabama. The tornado was rated EF3 and was on the ground for 68.4 miles (110.1 km). 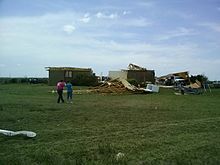 Several homes, a metal tower structure, and a steel-frame building were destroyed by the tornado. One person was killed and five were injured in Kemper County and another four people were injured in Noxubee County. A total of seven counties in Mississippi reported damage. Mississippi Governor Phil Bryant declared a state of emergency for Kemper and Noxubee counties due to the impacts of the tornado. Later that evening, an EF2 tornado passed west of Notasulga, Alabama and heavily damaged several homes and mobile homes. One mobile home was completely destroyed, and a well-built house received major damage to an outer wall and lost its entire roof. Trees and headstones were knocked over, and one person was injured by flying glass. Other weaker tornadoes were confirmed across parts of Louisiana, Alabama, and Georgia before the outbreak came to an end. On April 17, a powerful upper-level low pressure system and associated warm front developed across the central United States. The Storm Prediction Center issued a moderate risk of severe weather for much of central Oklahoma, including a 15% hatched risk of tornadoes, some of which were predicted to be strong. Several supercell thunderstorms developed that evening and rapidly became severe. Multiple tornadoes touched down across the risk area that evening and overnight, though all were weak and relatively brief. A few weak tornadoes also touched down in Texas and Missouri. Tornadoes continued touching down early into the morning of the 18th, including an EF2 that caused considerable damage near Zena, Oklahoma. Other weak tornadoes occurred later that afternoon in Arkansas, Mississippi, and Louisiana. The system also caused one tornado to touch down near Shelburne, Ontario (rated by Environment Canada to be an EF1, Canada's first tornado to be rated as such as the ratings are transitioned to the Enhanced Fujita Scale). Isolated tornado activity continued on the 19th, with several touchdowns occurring mostly across the eastern United States. Five tornadoes were confirmed, including an EF2 that caused severe damage in the town of Mansfield, Georgia. There were 247 tornadoes reported in the U.S. in May, of which at least 227 have been confirmed. A small tornado outbreak struck Italy that day. The first tornado struck Castelfranco Emilia (Modena), causing severe damage like a strong F2 or a low F3, and travelling for 18 km. The same supercell spawned a wedge tornado that struck Argelato (Bologna), causing F3 damage over a 20 km path and injuring some people. Near Mirandola (which was damaged by earthquakes in the previous year, in the same period) a strong F2 tornado damaged some buildings and injured 1 person. In total 3 tornadoes were recorded, 13 people were injured, 119 people were made homeless and the hail (up to 8 cm) caused severe damage to buildings and agriculture. Remains of a home that was reduced to a bare slab by an EF4 tornado near Granbury, Texas. During the evening of May 15, 18 tornadoes touched down over Texas, including one tornado in Granbury that was rated EF4. Extreme damage took place in Granbury where many homes were leveled. Six people were killed in the town while eight others were injured. All the deaths took place in the small sub-division of Rancho Brazo on the outskirts of Granbury. Surveys also revealed EF3 damage in Cleburne, caused by a large wedge tornado that touched down in the area. A weaker tornado struck the town of Millsap, destroying a barn and damaging several homes. Over the next two days, the system weakened but continued to produce a few tornadoes across the South. On May 16, four EF1 tornadoes touched down near the Texas/Louisiana state line (with two tornadoes in TX; two in LA). Several buildings and a few houses were damaged and one person was injured. On May 17, the system pushed eastward and two brief EF0 tornadoes touched down in Limestone County, Alabama, with several houses being damaged. A home largely destroyed by an EF4 tornado that touched down near Rozel, Kansas on May 18. During the evening of May 18, tornadoes touched down in parts of Kansas and Nebraska. However, most remained in open country with little damage. A large EF4 tornado near Rozel, Kansas damaged five farms and largely destroyed one home. On May 19, the slow-moving system produced another severe weather event just east of the previous day. Multiple tornadoes, mostly brief, were reported in Kansas once again. An EF2 tornado touched down near southwest Wichita, damaging several homes and many trees. Further south, two long-tracked wedge tornadoes moved in two corridors from Luther to Tryon and from Norman to McLoud in Oklahoma. Damage in both swaths was severe to extreme, with many houses destroyed. The second of these intense tornadoes, an EF4, struck a mobile home park near Shawnee in Pottawatomie County, damaging or destroying 30–35 homes. Two people were killed and six others were injured there. Storm spotters reported scoured earth along the tornado's track in this area. Throughout the state, 20 people were treated for injuries, while many others likely sustained minor injuries. Violent EF5 tornado on May 20 as it was approaching Moore, Oklahoma. During the evening and overnight hours of May 19, tornadic activity became more sparse, with a few tornadoes reported in Iowa, Illinois, and Missouri. At least two tornadoes were confirmed in Iowa, one near Huxley and another near Earlham. The touchdowns in Iowa marked the end of a 358‑day span with no tornadoes in the state. On the afternoon of May 20, a large, violent tornado touched down west of Newcastle, Oklahoma and impacted the town of Moore, causing severe damage to residential areas as well as Plaza Towers and Briarwood Elementary schools. The Oklahoma Office of the Chief Medical Examiner confirmed 24 fatalities, 7 of which were schoolchildren at Plaza Towers Elementary. After being preliminarily rated a high-end EF4, it was increased, and the tornado was given a final rating of EF5. The tornado followed a path similar to that of the F5 tornado that hit the area on May 3, 1999. The tornado became the first EF5 tornado in nearly two years. On May 21, an EF2 tornado touched down near the small community of Glenarm, Ontario about 12 kilometres (7.5 mi) west of Fenelon Falls, and Environment Canada confirmed that the roof of a home was torn off by the tornado and a barn was destroyed. No injuries were reported in this storm. This was Ontario's second tornado of the 2013 season. A large, slow moving system produced 86 tornadoes across the Great Plains in the last week of May. Many tornadoes, some strong to violent, touched down across Kansas and Nebraska from the 27th through the 29th, with weaker tornadoes recorded in other states. One of the most notable tornadoes of the outbreak was a 2.6 miles (4.2 km) wide wedge tornado that struck near El Reno, Oklahoma on the evening of May 31. It was the widest tornado ever recorded. The tornado was initially rated an EF5, with estimated winds being measured at >295 miles per hour (475 km/h) by a mobile Doppler radar; however, the worst damage was rated EF3, thus on August 30, 2013, the tornado's rating was downgraded to EF3. Eight deaths were attributed to this tornado including four storm chasers; TWISTEX project leader Tim Samaras, his son Paul, fellow chaser Carl Young, and amateur storm chaser Richard Charles Henderson. That same evening, a large EF3 tornado moved through several St. Louis suburbs, resulting in major damage and two injuries. In total, the outbreak resulted in 93 tornadoes. On May 3, a tornado struck several villages in Tarlac in the Philippines, damaging or destroying at least 101 houses and affecting over 400 people. On May 11, a tornado struck Kiziltepe, Turkey, killing one person. Another tornado impacted Turkey three days later, touching down in Mersin Province. Two people were killed and 19 others were injured when the storm struck a local airport. On May 22, an F2 tornado struck the town of Yefremov, Russia, damaging 200 homes and leaving 100 million rubles (US$31.9 million) in losses. An F1 tornado struck an industrial area of Cavenago, Italy about 9.3 mi (15.0 km) north Milan on May 29. At least 2 people were injured and many buildings were damaged or destroyed. There were 145 tornadoes reported in the U.S. in June, of which at least 126 have been confirmed. As a strong system moved through the United States, numerous tornadoes were reported. On June 9, an EF0 tornado struck the Ulysses, Kentucky area, causing minor damage. Two brief tornadoes touched down in Franklin County, Tennessee as well. An EF2 just north of Adairville, Kentucky on June 10 caused extensive damage along its 14 miles (23 km) track. Four tornadoes caused mostly minor damage in Maryland on June 10, as well as a few others causing damage in Virginia, North Carolina, South Carolina, and Delaware. An unseasonably strong low pressure system resulted in a severe weather outbreak across the Midwest on June 12. For the first time since April 14, 2012, a high risk of severe weather was issued for parts of the Midwest for June 12, with widespread damaging winds being the main threat. Tornadoes were a major threat as well, and several touched downed across Iowa, Illinois, and Ohio. At least 28 tornadoes were confirmed with the system as it pushed eastward, with tornadoes touching down in Maryland, Virginia, Tennessee, North Carolina, and Georgia on June 13. One tornado in Iowa was rated EF3, destroying two homes and a restaurant. An EF2 in Carroll County, Illinois pushed a home off of its foundation, damaged several outbuildings, and injured one person. A rare winter storm system moved through eastern Australia on June 12, with a supercell storm spawning a tornado north of Warwick in southern Queensland. Several rural homes and farms were severely damaged, with one house completely destroyed. However, there was only one injury reported. The storm was also accompanied by heavy rain and large hail. A second tornado was reported near Barraba in New South Wales, however it has not been confirmed. On June 19, a very unstable air mass developed over northeastern France. With CAPE levels of 5,000 J/kg, helicity of 239 m2/s2, and dew points as high as 23 °C (73 °F), numerous severe thunderstorms developed across the region. One of these storms produced an unusual EF3 tornado near the town of Châtillon-sur-Seine, France, in the department of Côte-d'Or. Unlike most tornadoes in France, this particular event took place alongside a bizarre macroburst, which was composed of 30 microbursts, in the rough terrain surrounding Châtillon-sur-Seine. The tornado developed from a supercell thunderstorm that formed around 4:45 pm local time. A high-precipitation type supercell, the storm quickly developed a significant downdraft. The tornado was estimated to have touched down around 5:40 pm along the north side of the rear-flank downdraft. Moving along an intermittent path to the northeast and later east-northeast, the tornado fluctuated between EF1 and EF2 intensity. As the storm moved over Étrochey, the tornado destroyed a stone barn, debarked and defoliated trees, broke concrete electrical poles, and tossed a heavy gate several hundred meters. Tiles from the roofs of damaged buildings were found up to 500 m (550 yd) away embedded in the ground. As it moved into Montliot-et-Courcelles, a home was largely destroyed, with debris strewn over several hundred meters. Overall, the tornado moved along a discontinuous path 14 km (8.7 mi) long and reached a maximum width of 250 m (270 yd). A total of 20 homes were severely damaged or destroyed while 190 more sustained varying degrees of damage. One person sustained minor injuries in relation to the tornado. This was the strongest tornado in France since the deadly 2008 F4 Hautmont tornado. On June 5, a rare tornado hit Naranjo de Alajuela, Costa Rica, ripping roofs off of houses. Several people were injured. Between June 6 and 7, Tropical Storm Andrea spawned several tornadoes across Florida and North Carolina. All were relatively weak, resulting in minor damage and one injury. There were 61 tornadoes reported in the U.S. in July; however, 69 were later confirmed. Several weak tornadoes touched down in the Eastern United States during the first two days of July. On the 1st, an EF1 tornado moved through Windsor, Connecticut, causing widespread damage. Other tornadoes touched down in Connecticut, New Jersey, Maryland, Illinois, and Florida. On July 2, an EF1 tornado struck near Florence, South Carolina, where several site-built homes and mobile homes were either damaged or destroyed and nine people were injured. Two other brief tornadoes affected North Carolina and Illinois, causing minimal damage. A small outbreak of weak tornadoes occurred in the Midwestern United States, lasting from July 9 to July 10. Several tornadoes touched down on the 9th in North Dakota, Nebraska, and Wisconsin, including an unusually long-tracked EF0 that stayed on the ground for 28 miles (45 km) near Irma, Wisconsin. Widespread damaging winds and some tornado activity continued the next day across Kansas, Indiana, the Ohio Valley, and the Northeastern United States, with none stronger than EF1 in intensity. Northern Ohio was the hardest hit, with five touchdowns confirmed. Other tornadoes touched down in Indiana, Kansas, Pennsylvania, and Connecticut. There were 37 tornadoes reported in the U.S. in August; however, 46 were confirmed. A brief but strong tornado spawned by a strong winter frontal system badly damaged several buildings in the town of Kingston SE, South Australia. Several roofs were torn off and the whole town was left without electricity due to power line damage, however there were no major injuries reported. There were 16 tornadoes reported in the U.S. in September; however, 22 were confirmed. Due to atmospheric instability associated with Severe Tropical Storm Toraji as it made landfall in Japan in early September, a number of F0 and F1 tornadoes occurred. Although there were no fatalities, 60 people were injured and over 1,500 houses were damaged. During mid-September, as Typhoon Man-yi approached and made landfall in Japan, at least ten F0 and F1 tornadoes were reported to have occurred in the Island nation. Over 900 homes were damaged and 10 people were injured. The city of Taquarituba, in the state of São Paulo, was partially destroyed by a 100 km/h (62 mph) tornado which damaged approximately 200 houses; 2 people died and 64 were injured. There were 76 tornadoes reported in the U.S. in October, of which at least 61 have been confirmed. 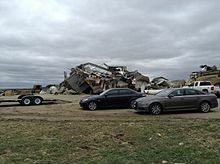 EF4 damage to a factory in Wayne, Nebraska from a tornado on October 4. A low pressure system produced several tornadoes across northeastern Nebraska, western Iowa, and extreme southeastern South Dakota. 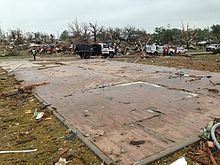 An EF4 tornado severely damaged and destroyed homes in and near Wayne, Nebraska, and caused major damage an industrial site and to a local airport, where several hangars were flattened. Another tornado, rated EF2, severely damaged or destroyed six homes in Macy, Nebraska. The storm system also produced a severe blizzard that impacted South Dakota. A tornado struck the western Victorian town of Ararat at 7:30 pm local time, causing significant damage to residential and commercial structures. A small outbreak of mostly weak tornadoes occurred across parts of the Southern and Midwestern United States. An EF2 tornado snapped trees and damaged three homes southwest of Baker, Missouri. An EF1 tornado damaged homes and other buildings in Vandalia, Ohio and eight people at a restaurant suffered minor injuries from broken glass. Overall, the storm system was responsible for a total of 46 tornado reports, 31 of which were confirmed. There have been 111 tornadoes reported in the U.S. in November, of which at least 77 have been confirmed. Neighborhood that was completely destroyed by a high-end EF4 tornado in Washington, Illinois. As a very strong and rapidly deepening storm system encountered an unseasonably warm air mass, a high risk of severe weather was issued by the SPC for November 17 for a large part of the Midwest, for only the second time in 2013 and the first time in November since November 15, 2005. A large outbreak of tornadoes occurred across the Ohio Valley and Great Lakes states, including one high-end EF4 tornado, with estimated winds of up to 190 mph (310 km/h) that struck the city of Washington, Illinois, where three people were killed and 125 others were injured. Another EF4 tornado tracked across parts of Washington County, Illinois, where it completely destroyed a farm house, killing two people inside, and caused damage to several structures in New Minden. Overall, the outbreak resulted in eight tornado related fatalities. Many other tornadoes impacted Kentucky and Indiana, as well as a few in Missouri, Michigan, Ohio, and Tennessee. Several tornado days occurred in November across eastern Australia. On November 18, an F1 tornado swept through the Sydney suburb of Hornsby, damaging the Westfield shopping centre and train station. The tornado caused eight injuries, five of which occurred when a demountable building flipped at Hornsby Railway Station. The next day, November 19, the town of Hervey Bay, Queensland was struck by a waterspout which came ashore in Urangan. Houses on one street were severely damaged by winds of up to 100 kilometres per hour (62 mph) an F0. Four days later, November 23, severe thunderstorms spawned at least 4 tornadoes in the Northern Tablelands region of New South Wales. One tornado destroyed a farmhouse, injuring its owner, and damaged several other buildings north of Guyra, New South Wales. The damage assessment conducted by the Bureau of Meteorology was unable to completely map tornado paths because, access was limited by the terrain and time was a factor. The tornadoes were conservatively rated as two F1s and two F0s. There were 16 tornadoes reported in the U.S. in December, of which at least 14 have been confirmed. The final tornado event of 2013 was a small outbreak of tornadoes that took place from December 20 to 21. The initial tornadoes on the 20th were weak, with an EF1 in Arkansas, and two EF0s near Jackson, Mississippi. The Storm Prediction Center issued a moderate risk for severe weather the following day, including a risk area with a 15 percent chance for tornadoes in parts of Louisiana, Arkansas, and Mississippi. Later that evening, an EF2 tornado passed near Hughes, Arkansas, destroying several mobile homes, killing one person and injuring three others. Another EF2 that passed near Rena Lara, Mississippi caused an additional fatality in a mobile home. Overall, the outbreak produced 13 tornadoes and resulted in two fatalities. 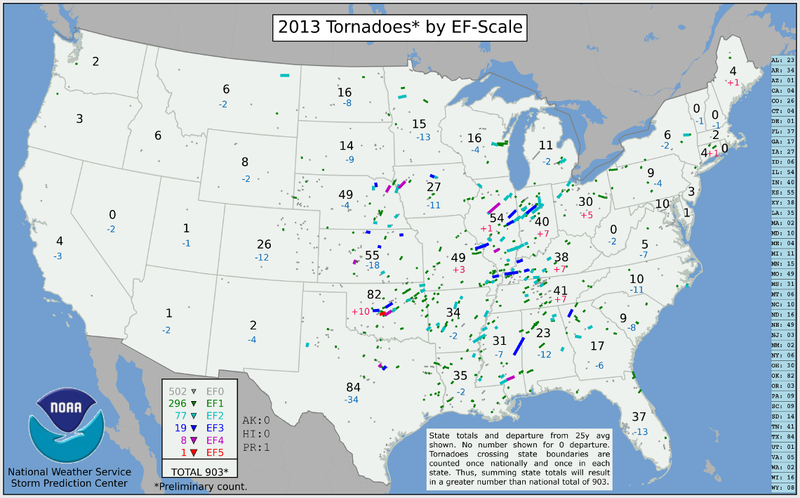 ^ "2013 Tornadoes by EF-Scale". Storm Prediction Center. National Oceanic and Atmospheric Administration. Retrieved May 10, 2015. ^ "Storm Events Database: January 1 – April 30, 2013 Tornadoes". National Climatic Data Center. National Oceanic and Atmospheric Administration. 2013. Retrieved March 28, 2014. ^ "Storm Events Database: May 1 – May 31, 2013 Tornadoes". National Climatic Data Center. National Oceanic and Atmospheric Administration. 2013. Retrieved March 28, 2014. ^ "Storm Events Database: June 1 – December 31, 2013 Tornadoes". National Climatic Data Center. National Oceanic and Atmospheric Administration. 2013. Retrieved December 20, 2013. ^ "Enhanced Fujita Scale (EF-Scale)". Environment Canada. 2013. Retrieved May 23, 2013. ^ Climate Prediction Center (February 4, 2013). "Cold & Warm Episodes by Season". United States National Oceanic and Atmospheric Administration's National Weather Service. Retrieved 25 February 2013. ^ Storm Prediction Center. "NWS Local Storm Reports". Severe Weather Event Summaries. Norman, Oklahoma: United States National Oceanic and Atmospheric Administration's National Weather Service. Retrieved 25 February 2013. ^ a b c d NWS Nashville, TN (February 8, 2013). "January 30, 2013 Tornado Outbreak". Nashville, Tennessee: United States National Oceanic and Atmospheric Administration's National Weather Service. Retrieved 11 February 2013. ^ a b NWS Peachtree City, GA (February 5, 2013). "Summary of Tornado and Severe Weather Event of January 30th, 2013". Peachtree City, Georgia: United States National Oceanic and Atmospheric Administration's National Weather Service. Retrieved 11 February 2013. ^ a b c "Tornadoes hit around Bundaberg". Sunshine Coast Daily. January 26, 2012. Retrieved January 27, 2012. 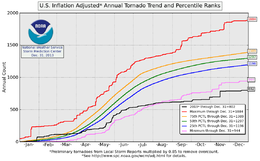 ^ "Inflation Adjusted Annual Tornado Running Total". Storm Prediction Center. Retrieved 15 April 2014. ^ "Tour of destruction - ABC Western Queensland - Australian Broadcasting Corporation". www.abc.net.au. Retrieved 2015-09-06. ^ "Outback tornadoes: One month on - ABC Western Queensland - Australian Broadcasting Corporation". www.abc.net.au. Retrieved 2015-09-06. ^ "Natural Disasters: 14 Feb 2013: House debates (OpenAustralia.org)". www.openaustralia.org.au. Retrieved 2015-09-06. ^ "One year on from Jundah's wild storm - ABC Western Queensland - Australian Broadcasting Corporation". www.abc.net.au. Retrieved 2015-09-06. ^ "Severe Storms Archive". Tornado ID: 1223. Bureau of Meteorology. Retrieved 2015-09-07. ^ "Severe Storms Archive". Tornado ID: 1224. Bureau of Meteorology. Retrieved 2015-09-06. ^ "Emergency Information | Bland Shire Council". blandshire.nsw.gov.au. Retrieved 2015-09-06. ^ "Ungarie waits again". ABC News. Retrieved 2015-09-06. ^ "Tornadoes hit coastal towns of Coonarr, Bargara and Burnett Heads, near Bundaberg". Courier Mail. January 26, 2012. Retrieved January 27, 2012. ^ Joynson, Tracey. "Amazing photos of tornado destruction at Burrum Heads emerge". Sunshine Coast Daily. Retrieved January 28, 2013. ^ "Sixth tornado hits southeast Queensland". The Age. January 27, 2012. Retrieved January 27, 2012. ^ "Mini tornado rips through housing estate at Mooloolaba". Sunshine Coast Daily. January 27, 2012. Retrieved January 27, 2012. ^ Queensland Regional Office (February 2013). Tropical Cyclone Oswald (Report). Australian Bureau of Meteorology. Archived from the original on February 6, 2013. Retrieved February 6, 2013. ^ Extreme Storms (January 27, 2013). Canberra severe storm and tornado (Report). Extreme Storms. Retrieved March 24, 2013. ^ Storm Prediction Center. "20130129's Storm Reports (1200 UTC - 1159 UTC)". Norman, Oklahoma: United States National Oceanic and Atmospheric Administration's National Weather Service. Retrieved 11 February 2013. ^ Storm Prediction Center. "20130130's Storm Reports (1200 UTC - 1159 UTC)". Norman, Oklahoma: United States National Oceanic and Atmospheric Administration's National Weather Service. Retrieved 11 February 2013. ^ Hoffman, Matt (January 30, 2013). "Georgia tornado ends record 220 day streak without a tornado death in the U.S." Gray Television, Inc. Archived from the original on 3 February 2013. Retrieved 11 February 2013. ^ Dolce, Chris; Erdman, Jon (February 2, 2013). 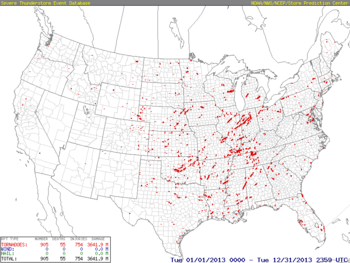 "Severe Weather Outbreak Recap: Jan. 29-30, 2013". The Weather Channel. Retrieved 22 February 2013. ^ "Severe Weather Statement: Tornado Warning". Iowa Environmental Mesonet. February 10, 2013. Retrieved February 11, 2013. ^ William Welch (February 10, 2013). "Tornado causes significant damage in Hattiesburg, Miss". USA Today. Retrieved February 11, 2013. ^ "Gov. Bryant declares emergency after tornado hits". WDAM.com. February 10, 2013. Archived from the original on April 12, 2013. Retrieved February 11, 2013. ^ Thompson, Richard L.; Grams, Jermey S. (February 18, 2013). "Feb 18, 2013 1300 UTC Day 1 Convective Outlook". Storm Prediction Center. Retrieved 23 February 2013. ^ a b c "Severe Thunderstorms & Tornadoes Across the Four State Region--February 18, 2013". National Weather Service Shreveport, Louisiana. February 22, 2013. Retrieved February 23, 2013. ^ "Tornado Survey - Shepherd, San Jacinto County". National Weather Service Houston, Texas. February 20, 2013. Retrieved February 23, 2013. ^ "Significant Weather - East Coast Low" (PDF). Monthly Weather Review - New South Wales. 2013 (February): 2. 26 March 2013. ISSN 1836-3067. Retrieved 8 July 2015. ^ Thompson, Angela. "South Coast hit by 'family of tornadoes'". Illawarra Mercury. Fairfax Regional Media. Retrieved 8 July 2015. ^ "Tornado rips through Kiama". Illawarra Mercury. Retrieved September 30, 2013. ^ Olding, Rachel. "Wild weather brings floods, 'mini tornadoes'". Brisbane Times. Fairfax Media. Retrieved 8 July 2015. ^ "Widespread Severe Weather Including Isolated Tornadoes Strike North and Central Georgia". National Weather Service Peachtree City, Georgia. Retrieved 21 March 2013. ^ "SPC Storm Reports for 3/18/13". Storm Prediction Center. Retrieved 21 March 2013. ^ "Tornado and Large Scale Hail/Wind Event on March 18, 2013". National Weather Service Birmingham, Alabama. Retrieved 21 March 2013. ^ "NWS Huntsville Storm Surveys From 03/18-20/2013". National Weather Service Huntsville, Alabama. Retrieved 21 March 2013. ^ Coombs, Stuart. "The March 21st 2013 Yarrawonga tornadoes". AMOS. Retrieved 3 July 2015. ^ Torndaoes and powerful storms hit Victoria's northeast (Report). news.com.au. March 22, 2013. Retrieved March 23, 2013. ^ World News Australia (March 22, 2013). Houses 'blown apart' in Vic tornado (Report). SBS. Retrieved March 23, 2013. ^ "Brahmanbaria tornado death toll rises to 31". 25 March 2013. Retrieved 27 March 2013. ^ a b "PM visits Brahmanbaria tornado victims". Daily Star (Bangladesh). 25 March 2013. Retrieved 27 March 2013. ^ "Tornado in Bangladesh kills 20, more than 200 injured". zeenews. 24 March 2013. Retrieved 26 March 2013. ^ "Tornado in Bangladesh Leaves 20 Dead, 200 Injured". abc news. 22 March 2013. Retrieved 26 March 2013. ^ a b "20 dead as tornado rips through Brahmanbaria". New Age. 23 March 2013. Retrieved 27 March 2013. ^ "Tornado in Bangladesh leaves 20 dead, 200 injured". Anchorage Daily News. 22 March 2013. Retrieved 26 March 2013. ^ "At least 21 dead as deadly tornado strikes Bangladesh". BBC. 24 March 2013. Retrieved 27 March 2013. ^ "20 dead, 300 injured after tornado hits Bangladesh". Hindustan Times. 23 March 2013. Retrieved 27 March 2013. ^ "Deadly tornado strikes Bangladesh". CNN. 23 March 2013. Retrieved 26 March 2013. ^ "Khaleda to visit tornado-hit Brahmanbaria Saturday". The Daily Star (Bangladesh). 26 March 2013. Retrieved 27 March 2013. ^ "Freak Tornado leaves 12 dead in Philippines". astro AWANI. Retrieved 28 March 2013. ^ "SPC Storm Reports for 04/07/13". Storm Prediction Center. Retrieved April 11, 2013. ^ "SPC Storm Reports for 04/08/13". Storm Prediction Center. Retrieved April 11, 2013. ^ "SPC Storm Reports for 04/09/13". Storm Prediction Center. Retrieved April 11, 2013. ^ a b "Severe Weather/Heavy Rain on April 10-11, 2013". National Weather Service Little Rock, Arkansas. Retrieved April 11, 2013. ^ a b "SPC Storm Reports for 04/10/13". Storm Prediction Center. Retrieved April 11, 2013. ^ "Kemper and Noxubee Counties Tornado". National Weather Service Jackson, Mississippi. April 12, 2013. Retrieved April 14, 2013. ^ "Macedonia/Ethelsville (Pickens) EF-1 Tornado April 11, 2013". National Weather Service Birmingham, Alabama. April 13, 2013. Retrieved April 14, 2013. ^ "UPDATED DAMAGE REPORTS FROM KEMPER AND NOXUBEE COUNTIES". Mississippi Emergency Management Agency. April 12, 2013. Retrieved April 13, 2013. ^ "SEVEN COUNTIES REPORTING DAMAGES TO MEMA". Mississippi Emergency Management Agency. April 11, 2013. Retrieved April 12, 2013. ^ "GOV. BRYANT DECLARES A STATE OF EMERGENCY DUE TO SEVERE STORMS". Mississippi Emergency Management Agency. April 11, 2013. Retrieved April 12, 2013. ^ "EF2 in Notasulga". National Weather Service Birmingham, Alabama. Retrieved February 23, 2014. ^ "SPC Storm Reports for 04/11/13". Storm Prediction Center. Retrieved April 14, 2013. ^ "Storm Prediction Center Apr 17, 2013 1630 UTC Day 1 Convective Outlook". Spc.noaa.gov. 2013-04-17. Retrieved 2013-11-19. ^ "The Severe Weather and Flooding Event of April 17, 2013". Srh.noaa.gov. Retrieved 2013-11-19. ^ a b c "SPC Severe Weather Event Review for Wednesday April 17, 2013". Spc.noaa.gov. 2013-04-17. Retrieved 2013-11-19. ^ "April 17-18, 2013 Tornado and Flood Event". Srh.noaa.gov. Retrieved 2013-11-19. ^ "Environment Canada confirms tornado touched down in Shelburne". 680News. 2013-04-19. Retrieved 2013-05-21. ^ "Meteorologist explains Melancthon tornado". Caledonenterprise.com. 2013-04-18. Retrieved 2013-05-21. ^ "Tornado Strikes Newton and Morgan Counties". Srh.noaa.gov. Retrieved 2013-11-19. ^ a b Associated Press (May 15, 2013). "Tornado impacts North Texas town". Granbury, Texas: CBS News. Retrieved May 15, 2013. ^ Gary Strauss (May 16, 2013). "At least 6 killed, up to 100 injured by Texas tornadoes". USA Today. Retrieved May 16, 2013. ^ "6 killed, 7 missing after mile-wide tornado rips through North Texas". Fox News. May 16, 2013. Retrieved May 16, 2013. ^ Reuters (May 16, 2013). "Texas tornadoes: 6 confirmed dead, more than a dozen injured". Chicago Tribune. Retrieved May 16, 2013. ^ "Tornadoes Across North Texas May 15, 2013". National Weather Service Fort Worth, Texas. May 16, 2013. Retrieved May 16, 2013. ^ "NWS Damage Survey Completed For The May 16th Severe Thunderstorms That Affected Extreme East Texas And Northwest Louisiana". National Weather Service Shreveport, Louisiana. May 18, 2013. Retrieved May 22, 2013. ^ "Severe Weather Event on May 17, 2013". National Weather Service Huntsville, Alabama. May 20, 2013. Retrieved May 22, 2013. ^ "20130518's Storm Reports (1200 UTC - 1159 UTC)". Storm Prediction Center. National Oceanic and Atmospheric Administration. May 20, 2013. Retrieved May 20, 2013. ^ "EF2 Tornado from May 18 thunderstorms". National Weather Service Office in Dodge City, Kansas. National Oceanic and Atmospheric Administration. May 19, 2013. Retrieved May 20, 2013. ^ a b "20130519's Storm Reports (1200 UTC - 1159 UTC)". Storm Prediction Center. National Oceanic and Atmospheric Administration. May 20, 2013. Retrieved May 20, 2013. ^ "May 19th Sedgwick County EF1 Tornado". National Weather Service Office in Wichita, Kansas. National Oceanic and Atmospheric Administration. May 19, 2013. Retrieved May 20, 2013. ^ Sean Murphy (May 20, 2013). "Oklahoma tornadoes leave 1 dead, 20 hurt". Shawnee, Oklahoma: The Columbus Dispatch. Associated Press. Retrieved May 20, 2013. ^ "No one Injured in Central Iowa Tornadoes". KCRG9. May 20, 2013. Archived from the original on June 19, 2013. Retrieved May 20, 2013. ^ Carey Gillam and Ian Simpson (May 21, 2013). "Oklahoma lowers tornado death toll amid frantic search". Reuters. Retrieved May 21, 2013. ^ a b "SPC Severe Weather Event Review for Monday May 27, 2013". Spc.noaa.gov. 2013-05-27. Retrieved 2013-11-19. ^ Forbes, Greg; Daniel, Matt (5 September 2013). "Why was El Reno, Oklahoma tornado downgraded to EF3?". EarthSky.org. unknown. Retrieved 5 November 2013. ^ "'Unpredictable' storm in Oklahoma turned on three chasers". CNN.com. Retrieved 2013-11-19. ^ Clay, Nolan (2013-06-03). "Oklahoma storms: Amateur storm chaser took photo of tornado that killed him". News OK. Retrieved 2013-11-19. ^ "Severe Weather Event - Nine Tornadoes Surveyed". Crh.noaa.gov. Retrieved 2013-11-19. ^ "Storm Prediction Center 20130531's Storm Reports". Spc.noaa.gov. Retrieved 2013-11-19. ^ "Over 100 families affected by tornado in Tarlac". The Philippians Star. 6 May 2013. Retrieved 6 May 2013. ^ "Kiziltepe'de Hortum Can Aldi" (in Turkish). Haberler. May 11, 2013. Retrieved May 16, 2013. ^ "Tornado kills one person in southern Turkey". The World Bulletin. May 14, 2013. Retrieved May 15, 2013. ^ "Mersin'de hortum: 2 ölü, 19 yarali" (in Turkish). Posta Hayata Giris Sayfaniz. May 14, 2013. Retrieved May 16, 2013. ^ "Tornado's path of destruction caught on camera". 9. 3 May 2013. Retrieved 31 May 2013. ^ "130609's Storm Reports (1200 UTC - 1159 UTC)". Storm Prediction Center. National Oceanic and Atmospheric Administration. June 9, 2013. Retrieved June 10, 2013. ^ "130610's Storm Reports (1200 UTC - 1159 UTC)". Storm Prediction Center. National Oceanic and Atmospheric Administration. June 10, 2013. Retrieved June 10, 2013. ^ "Jun 12, 2013 1630 UTC Day 1 Convective Outlook". Storm Prediction Center. National Oceanic and Atmospheric Administration. June 10, 2013. Retrieved June 12, 2013. ^ "130612's Storm Reports (1200 UTC - 1159 UTC)". Storm Prediction Center. National Oceanic and Atmospheric Administration. June 12, 2013. Retrieved June 14, 2013. ^ "130613's Storm Reports (1200 UTC - 1159 UTC)". Storm Prediction Center. National Oceanic and Atmospheric Administration. June 13, 2013. Retrieved June 14, 2013. ^ "Preliminary Storm Survey Results from the Wright and Franklin County Tornadoes June 12, 2013". National Weather Service Office in Des Moines, Iowa. National Oceanic and Atmospheric Administration. June 13, 2013. Retrieved June 13, 2013. ^ "Severe Thunderstorms June 12, 2013". National Weather Service Office in Davenport, Iowa. National Oceanic and Atmospheric Administration. June 13, 2013. Retrieved June 13, 2013. ^ "SE QLD/NE NSW - Showers/Rain & Isolated Storms - 9th-13th June 2013. Page 1". Weatherzone Forums. 13 June 2013. Retrieved 13 June 2013. ^ "Family recalls horror of freak storm that destroyed home". Warwick Daily News. June 13, 2013. Retrieved June 13, 2013. ^ "SE QLD/NE NSW - Showers/Rain & Isolated Storms - 9th-13th June 2013. Page 2". Weatherzone Forums. 13 June 2013. Retrieved 13 June 2013. ^ "Tornade EF3 à Etrochey (21) le 19 juin 2013" (in French). Keraunos. 2013. Retrieved June 23, 2013. ^ "Rare tornado rips apart homes in Naranjo". Inside Costa Rica. 2013-06-05. Retrieved 2013-11-19. ^ "SPC Storm Reports for 06/05/13". Storm Prediction Center. Retrieved June 7, 2013. ^ "SPC Storm Reports for 06/06/13". Storm Prediction Center. Retrieved June 7, 2013. ^ a b "20130701's Storm Reports (1200 UTC – 1159 UTC)". Storm Prediction Center. National Oceanic and Atmospheric Administration. July 1, 2013. Retrieved December 21, 2013. ^ a b "20130702's Storm Reports (1200 UTC – 1159 UTC)". Storm Prediction Center. National Oceanic and Atmospheric Administration. July 2, 2013. Retrieved December 21, 2013. ^ "Tornado Confirmed Near Windsor in Hartford County Connecticut". National Weather Service Office in Taunton, Massachusetts. National Oceanic and Atmospheric Administration. July 1, 2013. Retrieved July 11, 2013. ^ "Connecticut Event Report: EF1 Tornado". National Climatic Data Center. National Oceanic and Atmospheric Administration. 2013. Retrieved October 29, 2013. ^ "South Carolina Event Report: EF1 Tornado". National Climatic Data Center. National Oceanic and Atmospheric Administration. 2013. Retrieved October 31, 2013. ^ "20130709's Storm Reports (1200 UTC – 1159 UTC)". Storm Prediction Center. National Oceanic and Atmospheric Administration. July 9, 2013. Retrieved October 10, 2013. ^ "Funnel Clouds and Tornadoes in Northern and Central Wisconsin". National Weather Service Office in Green Bay, Wisconsin. National Oceanic and Atmospheric Administration. July 10, 2013. Retrieved July 10, 2013. ^ "20130710's Storm Reports (1200 UTC – 1159 UTC)". Storm Prediction Center. National Oceanic and Atmospheric Administration. July 10, 2013. Retrieved October 10, 2013. ^ "Tornado tears through SA town". 7 News. August 3, 2013. Retrieved August 3, 2013. ^ a b c d Japan Meteorological Agency (November 22, 2013). Member Report: Japan (PDF). ESCAP/WMO Typhoon Committee: 8th Integrated Workshop/2nd TRCG Forum. ESCAP/WMO Typhoon Committee. p. 9. Archived from the original (PDF) on November 26, 2013. Retrieved November 26, 2013. ^ "Japan Tornado: Dozens Injured In Saitama". Sky News. September 2, 2013. Retrieved September 6, 2013. ^ 台風第１８号による被害状況等について（第１１報） [Damage status, etc. according to 18 Typhoon (Report 11)] (PDF) (in Japanese). Japan Fire and Disaster Management Agency. October 7, 2013. Archived (PDF) from the original on December 21, 2013. Retrieved December 21, 2013. ^ "Tornado destrói 200 casas na cidade Taquarituba, no interior de São Paulo" (in Portuguese). Jornal Nacional. September 23, 2013. Retrieved December 7, 2015. ^ "Tornado no interior de SP teve ventos acima de 100 km/h, aponta radar" (in Portuguese). UOL Notícias. September 23, 2013. Retrieved December 7, 2015. ^ "Sobe para 64 número de feridos durante tornado no interior de São Paulo" (in Portuguese). Último Segundo. September 23, 2013. Retrieved December 7, 2015. ^ "131004's Storm Reports (1200 UTC - 1159 UTC)". Storm Prediction Center. National Oceanic and Atmospheric Administration. October 4, 2013. Retrieved October 5, 2013. ^ "Wayne, NE Tornado on October 4 Rated EF4". National Weather Service in Omaha/Valley, Nebraska. National Oceanic and Atmospheric Administration. October 5, 2013. Retrieved October 7, 2013. ^ "Macy, NE to Sloan, IA Tornado on October 4 Rated EF2". National Weather Service in Omaha/Valley, Nebraska. National Oceanic and Atmospheric Administration. October 5, 2013. Retrieved October 7, 2013. ^ Daniel Simmons-Ritchie (October 8, 2013). "Tens of thousands of cattle killed in Friday's blizzard, ranchers say". Rapid City Journal. Rapid City Journal. Retrieved October 19, 2013. ^ "Ground shook as 'mini tornado' hit Ararat". 9 News National. Retrieved 21 November 2013. ^ "'Mini tornado' damages homes in Ararat, Victoria". Herald Sun. Retrieved November 21, 2013. ^ a b "20131031's Storm Reports (1200 UTC – 1159 UTC)". Storm Prediction Center. National Oceanic and Atmospheric Administration. October 31, 2013. Retrieved November 1, 2013. ^ "Record Tornado Event October 31, 2013". National Weather Service Office in Paducah, Kentucky. National Oceanic and Atmospheric Administration. November 9, 2013. Retrieved November 20, 2013. ^ "October 31 - November 1, 2013 Tornado in Vandalia, OH". National Weather Service Office in Wilmington, Ohio. National Oceanic and Atmospheric Administration. November 1, 2013. Retrieved November 20, 2013. ^ "November 17, 2013 0600 UTC Day 1 Convective Outlook". Storm Prediction Center. National Oceanic and Atmospheric Administration. November 17, 2013. Retrieved November 17, 2013. ^ "Long-Track Washington Tornado (Tazewell, Woodford, La Salle, Livingston Counties)". National Weather Service Office in Lincoln, Illinois. National Oceanic and Atmospheric Administration. November 19, 2013. Retrieved November 20, 2013. ^ "Storm Survey". National Weather Service in St. Louis, Missouri. National Oceanic and Atmospheric Administration. November 19, 2013. Retrieved November 20, 2013. ^ Dr. Jeff Masters (November 18, 2013). "Rare November Tornado Outbreak Kills 6; Subtropical Storm Melissa Forms". Weather Underground. Weather Underground. Retrieved November 18, 2013. ^ "20131117's Storm Reports (1200 UTC - 1159 UTC)". SPC. SPC. November 17, 2013. Retrieved November 25, 2013. ^ "Hornsby tornado: nothing mini about it". Sydney Morning Herald. Retrieved November 21, 2013. ^ "Gusts above 100km/h in freak Hornsby tornado". 9 News National. Retrieved November 21, 2013. ^ "Waterspout winds rip roofs off in Hervey Bay". ABC News. Retrieved November 21, 2013. ^ "4 Tornadoes Confirmed near Guyra 23rd November 2013 - Storm | Storm chasers Extreme Storms & Storm Chasing". Retrieved 2015-09-06. ^ "November 2013 Storm Outbreak - NENSW/SEQLD - Photos, Videos & Chase Reports. Page 3". Weatherzone Forums. November 29, 2013. Retrieved November 29, 2013. ^ "Tornado and storms cause havoc: Namoi SES". ABC News. Retrieved November 29, 2013. ^ "Tornado Damage and Flooding on December 20-21, 2013". National Weather Service Office in Little Rock, Arkansas. National Oceanic and Atmospheric Administration. December 25, 2013. Retrieved January 12, 2014. ^ "December 20th-21st 2013 Severe Weather". National Weather Service Office in Jackson, Mississippi. National Oceanic and Atmospheric Administration. December 22, 2013. Retrieved January 12, 2014. ^ "Dec 21, 2013 1300 UTC Day 1 Convective Outlook". Storm Prediction Center. National Oceanic and Atmospheric Administration. December 21, 2013. Retrieved January 12, 2014. ^ "20131221's Storm Reports (1200 UTC - 1159 UTC)". Storm Prediction Center. National Oceanic and Atmospheric Administration. December 21, 2013. Retrieved January 12, 2014. This page was last edited on 4 March 2019, at 22:40 (UTC).